Are you as obsessed with warm and hearty meals as I am this winter? Ok, let's be real - all I want to do is curl up with a big vat of coffee, a warm blanket, and hibernate while watching Elf on replay! 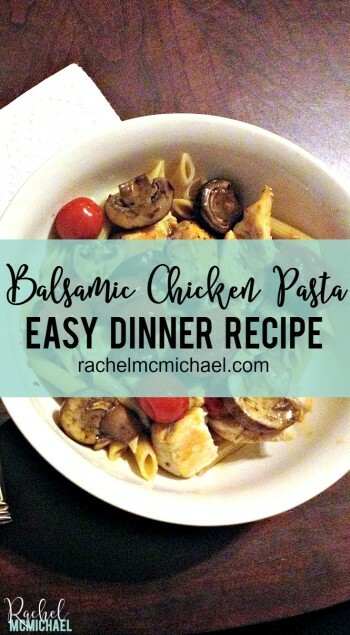 Add this Balsamic Chicken Pasta to my bowl and I'll be happy as can be. Seriously, though - you already know my 3 requirements for any meal, and this one is easy as can be! It is super-filling (we couldn’t finish our bowls) and doesn't take much time at all. 1. Cut chicken breasts into 1" squares and cook on medium heat in a large skil­let. Sea­son lightly with Cavender’s Greek sea­son­ing. 2. Combine mush­rooms, toma­toes, a light coating of vinaigrette dress­ing (I use about ¼ of the bottle) in a large skil­let. Season lightly with Cavender’s Greek seasoning. Cook on low to medium heat until veg­gies are ten­der. 3. Cook pasta to pack­age direc­tions. 4. Cook steamed vegetables according to package directions and sprinkle lightly with Cavender’s Greek Seasoning. 5. Divide pasta, chicken, and tomato/mushroom mix among four bowls. Sprinkle feta or parmesan cheese on each bowl. Serve with a side of steamed vegetables and/or fruit. Note: The last time I made this, we forgot about the cheese last night and the recipe was great without it. This post is linked up with Jill for The Fit Dish, Pint Sized Baker for Two Cup Tuesday, and Love from the Kitchen for Tuesday’s Table. Make sure to check them out! So tell the truth - have you watched Elf yet this season? Have you hung the tree? Are you ready to curl up and hibernate with a big bowl of Balsamic Chicken Pasta?